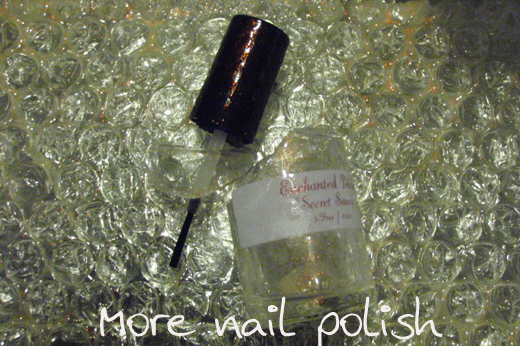 Last week I had the pleasure to receive a box full of Enchanted Polishes sent to me for reviewing purposes. But there is nothing worse than when the delivery man hands over the package and you can smell it. You just know that some poor polish is laying in that box, all gooey and sticky, bleeding its beloved innards all over its self, and potentially all the other polishes in the package. Chelsea had packaged the box up perfectly, but unfortunately this box received some bad handling, cause one corer of the box was smashed in, and when I opened it, that was where the broken bottle lay. Chelsea had already gone to so much effort to select, package and send these to me, I didn't want her to have to resend just one polish for me to blog about. 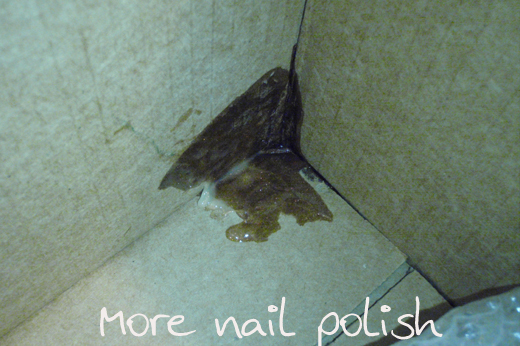 I wanted to see if I could at least salvage one mani good enough to blog about, out of that gloopy polish in the box. I grabbed a palette knife and scraped up some polish and wiped it onto my glass table. 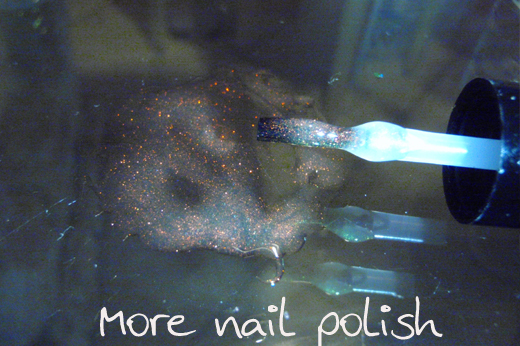 I then added nail polish thinner one drop at a time until I was able to get a workable consistency. Then I applied two coats of Secret Sauce, straight off the glass table onto my black base. 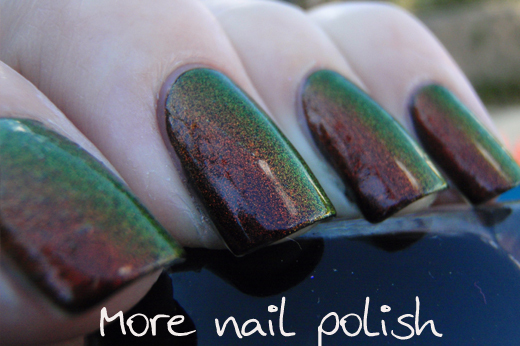 As you can see, Secret Sauce is a colour shifting top coat. 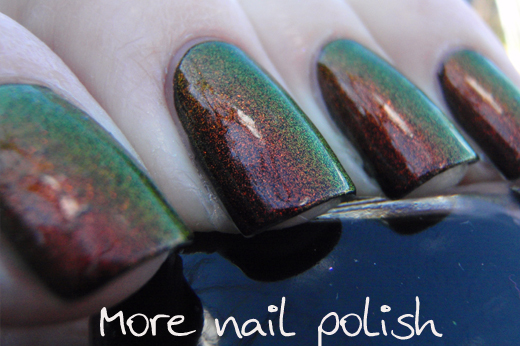 This is a topcoat made with the red to green colour changing powder that I sold small sample size amounts of last year. 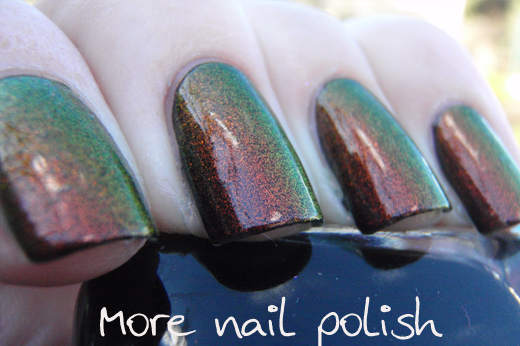 I've not worn one of these color shifting polishes in ages and I forgot how simply amazing this shizz is. So while I can't specifically comment of the formula or the brush of this polish, I can say that if I can get it to work this good off a lump of polish in the corner of a box, reconstituted on a glass table, then I think you will be pretty much right with a bottle of Secret Sauce. Bravo! 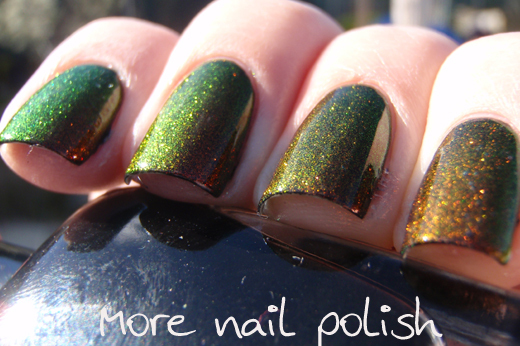 You are a polish sorceress to make that work :). You deserve a medal! It's really beautiful...I appreciate your hard work! my bottle of secret sauce broke as well. Except I recieved mine in perfect condition, and I was worried it was over filled? Oh well!! 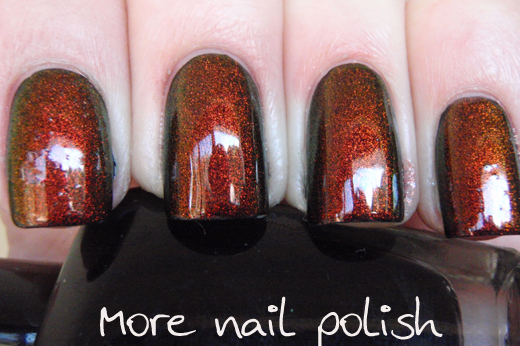 It is such a beautiful polish! and beautiful swatch! Your so smart to be able to retive a little bit like this. Are there nail polish blogger awards? There should be, and I'd nominate this post for Most Tenacious Application of the Year! You are MacGyver! I'm sorry for your loss- Secret Sauce looks amazing. I love it! Good save indeed! 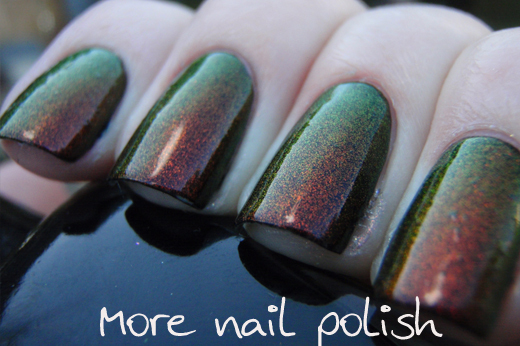 That polish is amazing! Completely worth the effort you went to save it! Amazing rescue! I would never have thought to do that! Pretty! It's a shame it was smashed. That is gorgeous, and I love your story! That is an impressive colour! 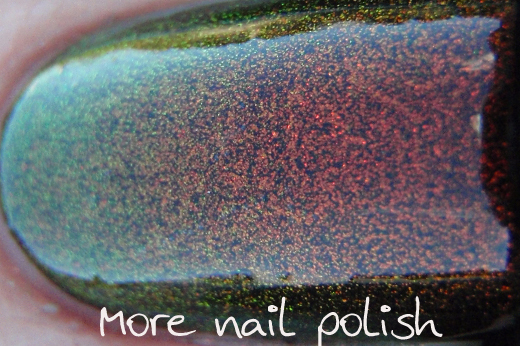 Also impressive that you went through all that to get the polish! BRAVA!! You are brilliant, m'dear and your nails ROCK!! *sniff* I love a story with a happy ending. Chelsea needs to send you a lifetime supply of Secret Sauce because you are so crafty, your swatches are amazing, and I didn't think I needed this because I have Shift Happens but now I'm pretty sure I need both of them. You're rad. I love this post! 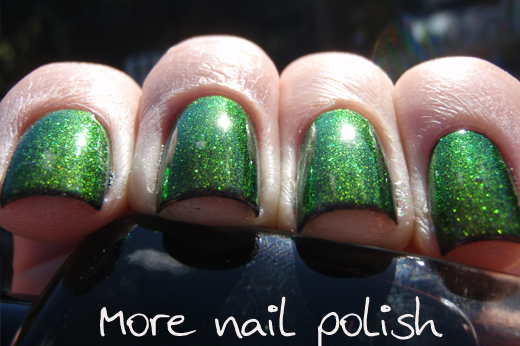 It's amazing that you were able to do such great swatching from such a small amount of spilled polish! And you saved a little bit! My hero ! Good on you for handling it like that!